Family and friends can use BUNK ONE to send emails to their camper. Campers will not be allowed to send a response email, but can get one Bunk One update per day. Bunk One messages are distributed with the mail after lunch daily. 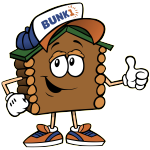 If you had an account with BUNK 1 last year, simply login to the same account this year. For all new users, please click here. You will need to enter an invitation code. The invitation code for Camp Marymount is MARY15B1.